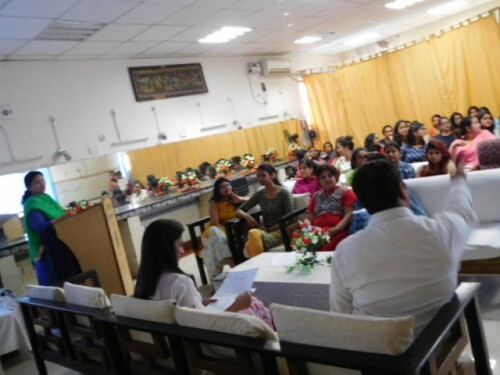 Beginning in January 2017, IBJ India partnered with Department of Psychology of Indraprastha College for Women in New Delhi to offer legal and psychological support to female inmates in Delhi Prisons. Ajay Verma speaks with students about the importance of early access to counsel. Early access to a lawyer is critical in ensuring that a person accused of a crime has her or his due process rights respected, for example with regards to bail applications. Bail is an essential part of criminal justice in ensuring that the accused is not detained and jailed for excessive periods of time while awaiting trial – a critical period of time when torture and other abuse is most likely to occur. IBJ has worked extensively in India to ensure each individual has early access to counsel. This project, led by IBJ Fellow Ajay Verma, is a significant component to furthering that mission. 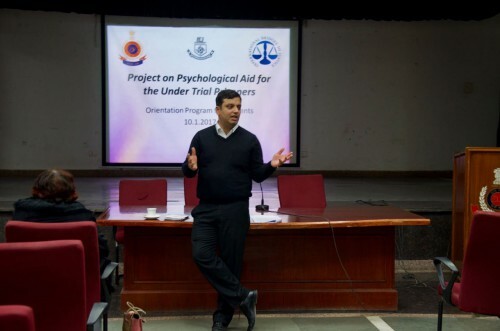 “Psychological Aid for the Undertrials: A Community Outreach Project” was set up between IBJ and the Indraprastha College for Women in coordination with Delhi Prisons to provide comprehensive legal and psychological assistance to incarcerated women in one of the nine central prisons in the Delhi Prisons complex. Students and IBJ volunteers interviewed women about their experiences, both from a legal and psychological perspective. Much of their discussion centered around the women’s socio-economic background and history, as well as their many difficulties in securing reliable and effective counsel. As one student described, “Our role was to identify persons to whom we could provide legal aid, and also to be able to talk to the inmates and encourage them.” Their interactions with the inmates revealed the profound interactions between the psychological aspects of incarceration with the need to access to legal counsel and trial. Often closely linked, the psychological and legal concerns create a distressing and challenging environment for each of the prisoners’ mental, physical and psychological health. IBJ’s role throughout the process was to provide legal assistance to inmates identified as being without legal counsel. The focus of the students on developing empathy for the women whom they were interviewing and the availability of legal support from IBJ were both essential in creating a structure through which, to offer the prisoners relief from some of their distress while incarcerated. IBJ’s mission to ensure early access to counsel proved critical in many of the cases reported through this project. Many of the women who were interviewed expressed minimal or no support from their own private lawyer, in which case IBJ was able to step in and offer its legal counsel in these urgent situations. As one student noted, “She was in need of a lawyer and this case was forwarded to Ajay Verma.” Through the lens of these stories, the urgency of reliable and timely counsel was reinforced as fundamental to the alleviation of harmful conditions. Many of the concerns and painful circumstances the women reported stemmed from violations of legal procedure and the lack of a presence of a dedicated lawyer. With the assistance of IBJ, dozens of these women now have the opportunity to access justice and be fairly judged. Many have been reunited with their families. Today in the prison, IBJ has developed a sense of hope among the jailed inmates that, if no one comes to help them, IBJ’s lawyers will be there to provide help.